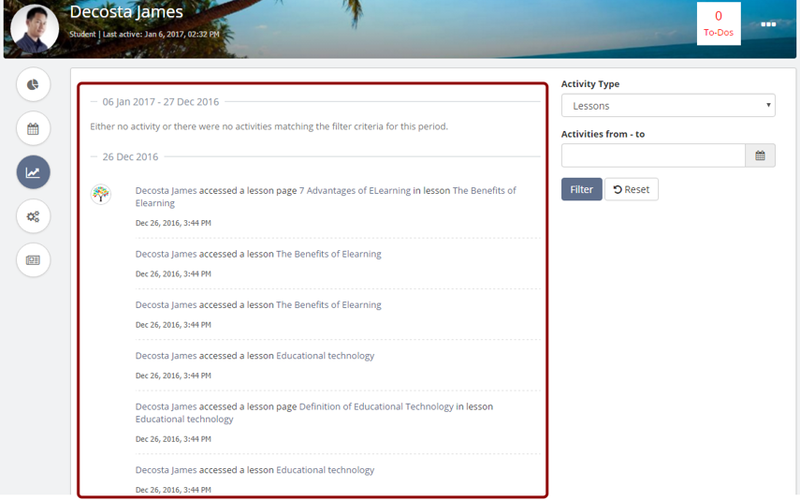 As a learner, now you can track all the activity done by you in a particular classroom from the Activity Stream page. 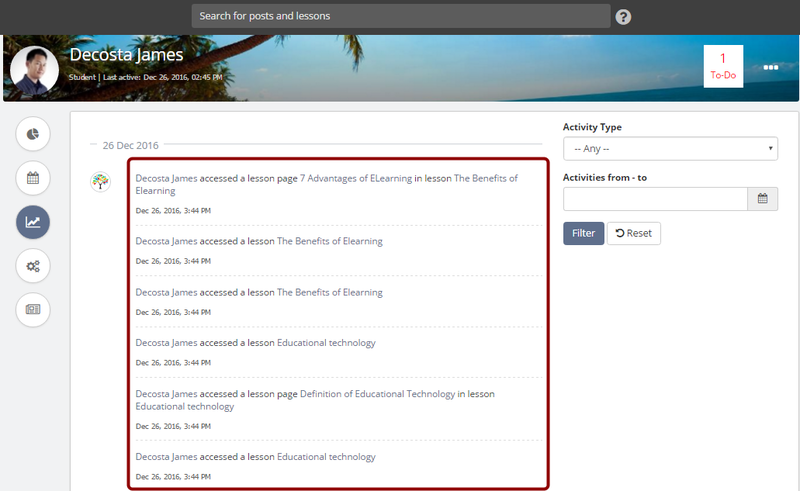 Basically, the Activity Stream is a place from where you can know which resources (Posts, Lessons and Assessments) have been accessed, completed and when. You can also view the date and time at which you logged into the site. So when you get to Activity Stream page, you may choose to see cumulative stats of all activity done by you on a particular resource. For e.g. 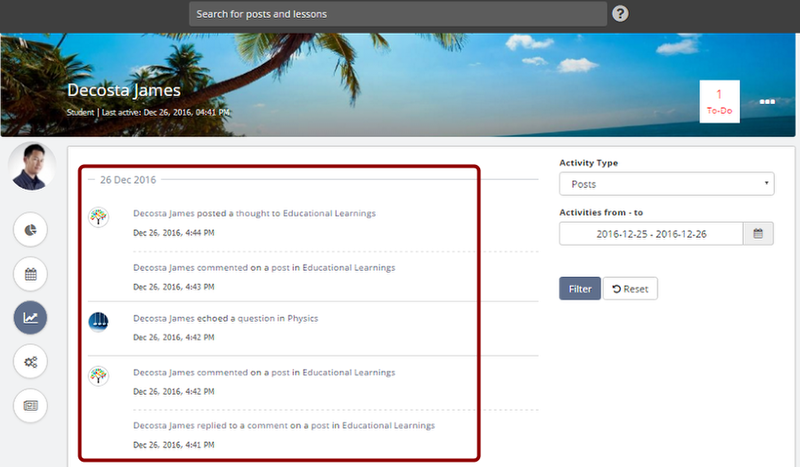 as a learner, you can find out how many posts have been shared by you so far in a classroom and lots more. In this article, we will focus on some important activities that we think, as a learner, you must know. 2. Click on your profile at the top of the sidebar. 3. Click Recent activities tab. 4. 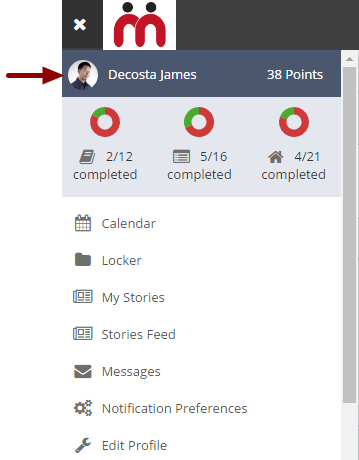 The Activity Stream report shows which activities are done by you on different resources (Posts, Lessons and Assessments) in the classrooms that you are associated with. 5. Click Activity Type filter at the top-right of the page to select the resource type whose recent activities you wish to filter. By default, the Activity type filter is set to --any--. 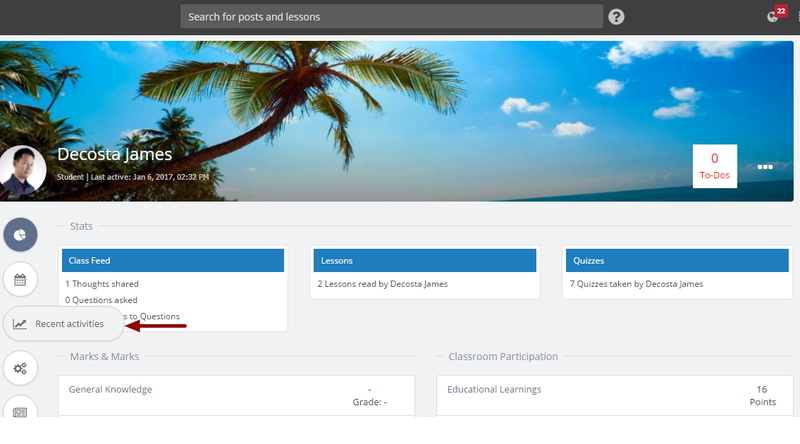 In case you wish to know about the lessons / lesson pages accessed by you, then select Lessons from the drop-down menu and click Filter. 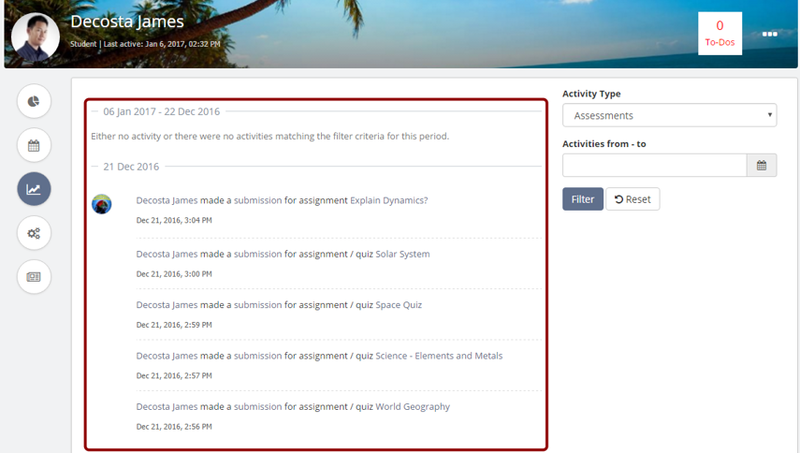 Note: Users filter in the activity type filter is not applicable for Learners because users filter action records the activities when certain action takes place on a user's account. 6. You will see a list of lessons and lesson pages that you have accessed so far. 7. Select Assessments from Activity Type drop-down menu and click Filter to know the details of assessments attempted by you so far. 8. You will see a list assessments that you have attempted in the past i.e. assessments to which you have already made submissions. 9. You can also view the recent activities performed by you on different posts. To do this, Select Posts from Activity Type drop-down menu and click Filter. Whenever you create a new post (thought/question), an entry is made in activity log. Whenever you participate in a post (add a reply or comment on it). 11. You can also apply Activity Type filter with date range combinations. 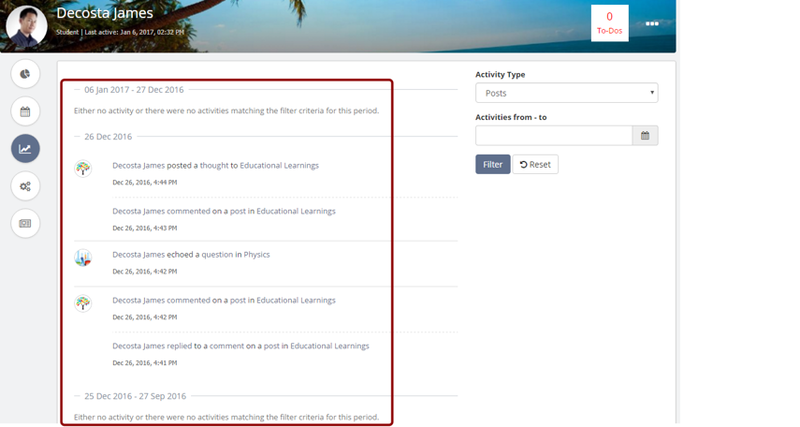 For eg: to know which activities were performed by you on posts in the current week. 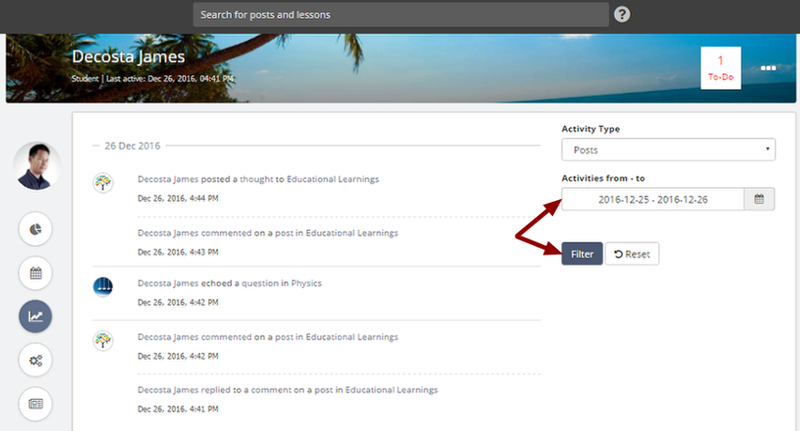 For this, select Posts filter from the Activity type drop-down list and then select This week from the Activities from - to date picker field. 12. Similarly, you can choose another date filter, such as, Last week, This month, Last month and Custom Range. 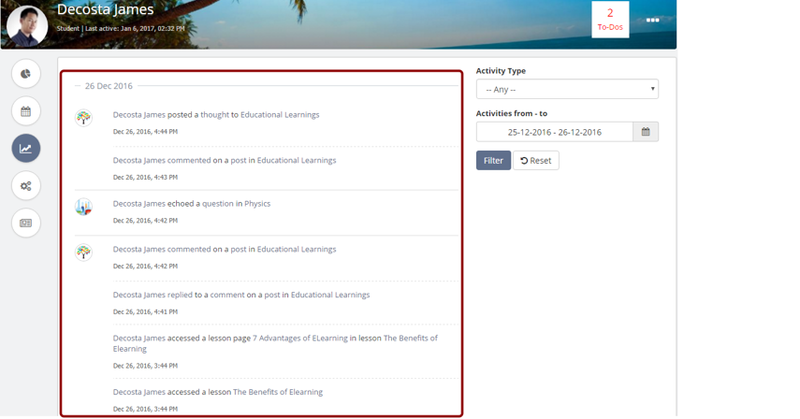 In this example, we are demonstrating how to find out the list of activities done on Posts in a specific period. 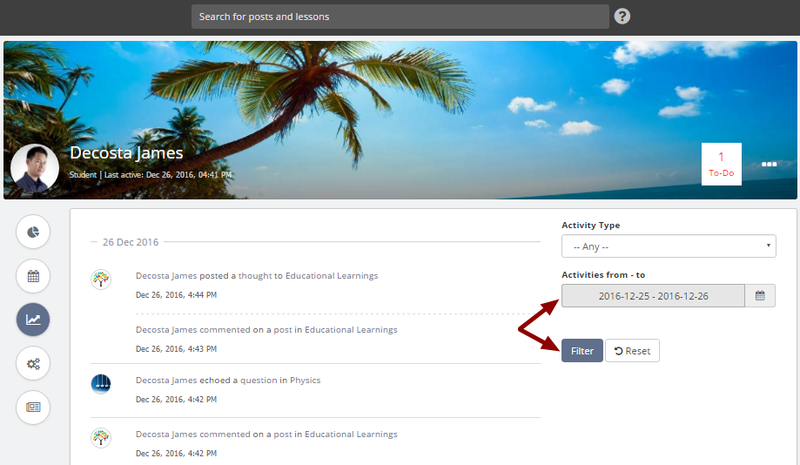 For this, select Posts filter from the Activity Type drop-down menu and then click Custom Range in order to select a specific period date range from the date picker. 13. After you have selected the desired date from the date picker, click Filter to apply the selected filters. 14. Once you have applied the filters, you will see a list of posts that you have created / participated (added your replies or comments) in the selected period. 15. 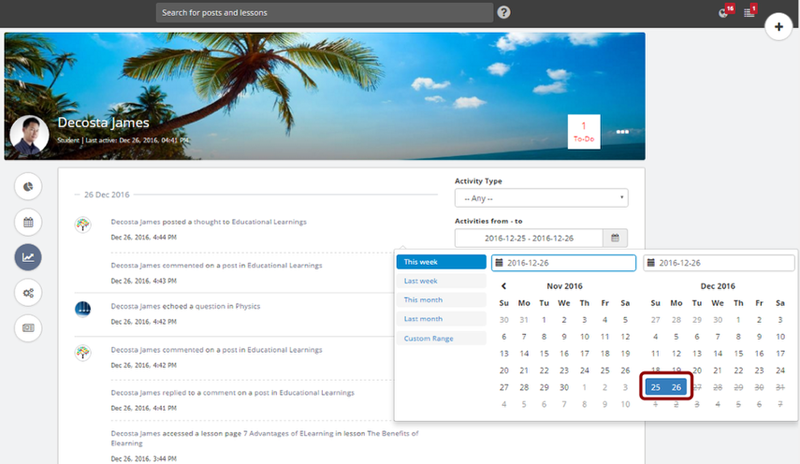 Similarly, you can also find cumulative stats of the activities done on all the resources (Posts, Lessons and Assessments) in a specific period by selecting the date range from the date picker. To do this, click Reset to reset Activity Filter type value to - - Any - - (which is the default value) and then select the dates (From and To date) of your choice from the date picker. 16. Click Filter after selecting the dates. 17. You will see a list of activities which have been performed by you on various resources in that period.